They’re having a Christmas party at your office, and you are Jewish, and you prefer Santa to Jesus this time of year. You are intermarried and you are Jewish and you have to make an appearance at your inlaws’ home or the home of others in the family, and it’s all so Christmas-y and Jesus-y and awkward for you, especially after what (fill in the blank) said to you last year. You are a Messianic Jew, and Christmas doesn’t offend you even if it’s not your style, but you know some Messianics who treat keeping Christmas like it’s the Mark of the Beast. You expect one or more of them to be there and it’s likely to get hairy. 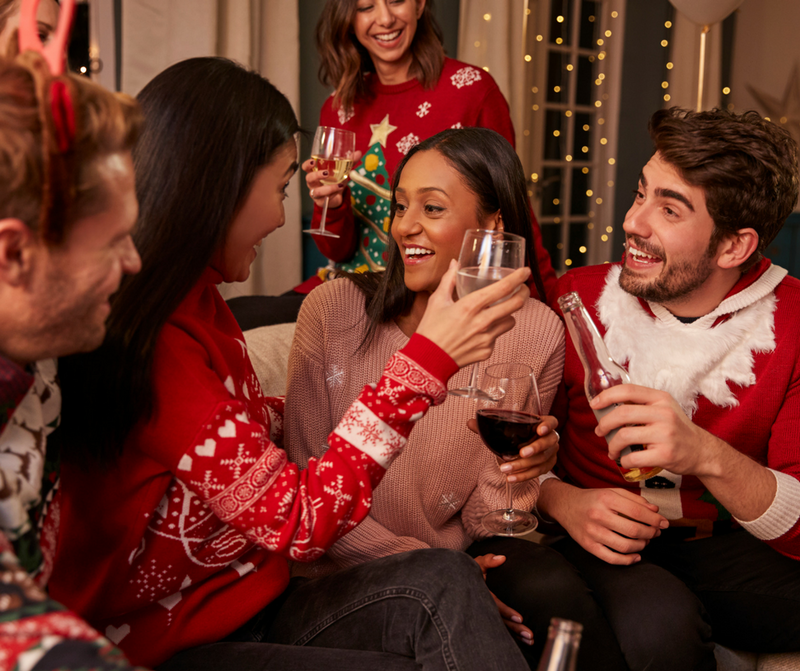 Somebody authoritative, someone wise, someone all-knowing needs to step in and establish some ground rules so that all these relationships will get out of Christmas alive. Well, that person is not here, but I am. And here is my advice. My seven guidelines for a survivable Christmas party. Show up – Even if that event is not your style, you have nothing to be ashamed of, and if you will just pay attention to these seven guidelines you will do just fine. But not showing up may send a signal that you are the person with the problem, or that you are being difficult. Do you want that? I didn’t think so. Show up. Shut up – Perhaps you have an axe to grind or a platform you want to stand on when it comes to Christmas. You want to denounce it as a pagan holiday. Or perhaps you want to treat the Christmas season like it’s open season for preaching to everyone. Or maybe you want to protest how everyone is wishing you a Merry Christmas and you’re Jewish and you don’t celebrate Christmas. Well, as respectfully as I can, I say unto thee, “Shut up!” People didn’t invite you to this shindig to grind your axe, to set up your platform, or to ride your hobby horse. If you are the host, can you have all kinds of Christmas-y stuff at the event? Sure? A crèche? As many as you like! But if you intend for this to be an opportunity to give an evangelistic pitch to your Jewish visitors and others, be honest with your guests and tell them in advance, “Please come to our home for a Christmas season celebration. Prepare to be preached to.” And if that is not your intent, then don’t do it. Shut up. Lighten up – If you show up with white-knuckled dread, grinding your teeth, and kicking somebody’s puppy on your way up the driveway, it’s not going to be a good day. You can survive this, and if you focus on those people with whom you can have a great conversation instead of on what you dread, this will be fun. So lighten up: you are not there to convince them of your thing, whatever it is. So don’t try. And they won’t be able to convince you of their thing, so don’t worry. Instead, lighten up. Brighten up – You can make every one’s day brighter if you will do one thing. In one on one conversation with them, ask them questions about how they are doing, about their family, about what’s going on in their lives, about what movies they have seen lately, books read, or whatever. Show an interest in these people by asking questions, and as my friend, author Jill Kamp-Melton wisely says, “Zip it.” Listen more, talk less. People will think you a wonderful conversationalist. By doing this you will absolutely brighten up their lives. Back off – If someone makes statements to you or makes statements at the event which are unwise, argumentative, or in other ways unwelcome, let the statements die by not feeding them. It is like not feeding a fire. An ancient proverb states it well: “Fire goes out without wood, and quarrels disappear when gossip stops.” So in such a conversation you have power. Don’t try to put out the fire. Don’t argue with the person. Sometimes it is good to remind the person, “Hey, let’s not talk about that now. Let’s talk about __________.” Just stop feeding the negative conversation and the controversy. Back off. Speak Up – You are not there simply to listen and to duck. You can and should speak up. Think of your task as being to “seed” the conversation and the nature of dialogue at the event with positive seed ideas, usually stated as a question rather than a statement. Something like this: “Did anybody else find the traffic crazy this week? Why do you think that was?” Make these light-hearted uncontroversial questions. This means don’t ask something like, “What do you all think of President Trump?” Seed the conversation, seed the atmosphere, with positive things. You can change the temperature in the room. Speak up. Seek out your hosts, smile at them, tell them how grateful you are for having been invited. Wish them a Merry Christmas. Seek out other people with whom you had significant conversations, smile and tell them, “I need to go now. But I enjoyed being with you.” And if this is a person with whom you want to have continued contact in the near term, make sure you exchange contact information in some way. Smile at everyone and say good bye as you take your leave. In other words, leave everyone with a good impression of you. Leave well. If you will follow these guidelines, you’ll have a great time at the party. In fact, you’ll make things better for everyone else too! And that’s a Christmas bargain no one should pass up. Enjoy!